I am a pro. A pro at procrastination, that is. 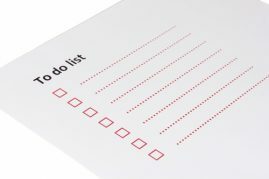 I assume other widows get things done right away so they don’t have a To Do List, or a to do pile. Case in point. The small plastic hook I bought for hanging my bathrobe on the bathroom door, still lay in its original packaging making me uneasy every time I walked by. So, one morning I grabbed it determined to put it where it could be used. The directions were simple, and I soon installed one for me and one for my mom. Why had I procrastinated so long? Because I had never done anything like it, I hadn’t bothered to read the directions, and so I dreaded the unknown. Some people procrastinate by refusing to say they are sorry. Or they might put off visiting a sick friend. Some don’t update their will, don’t pay their bills on time, or other innumerable things. King David’s procrastination had adverse consequences. When he tarried at Jerusalem and didn’t go to battle, he committed adultery and then murder. I wonder how many times he thought back and regretted not going to battle with his men. Dear widow, have you been putting off something? Whatever it might be, on or off your To Do List, I encourage you to take the initiative and fix it today. If it’s your salvation, please don’t procrastinate!